Marbella is located some 50km from Malaga airport and is famous for attracting the rich and famous since the early 1950’s. it covers an area of approximately 117km2 and has a population of a little under 140,000 inhabitants, making it the second most populated city in Malaga province and the eighth in Andalucía. For many decades, it has been a main destination for luxury cruises as well as a popular destination for people from northern Europa, Saudi Arabia, U.A.E and from the USA. It is a highly popular destination for its outdoor facilities and great infrastructure as well as beaches and attractions. 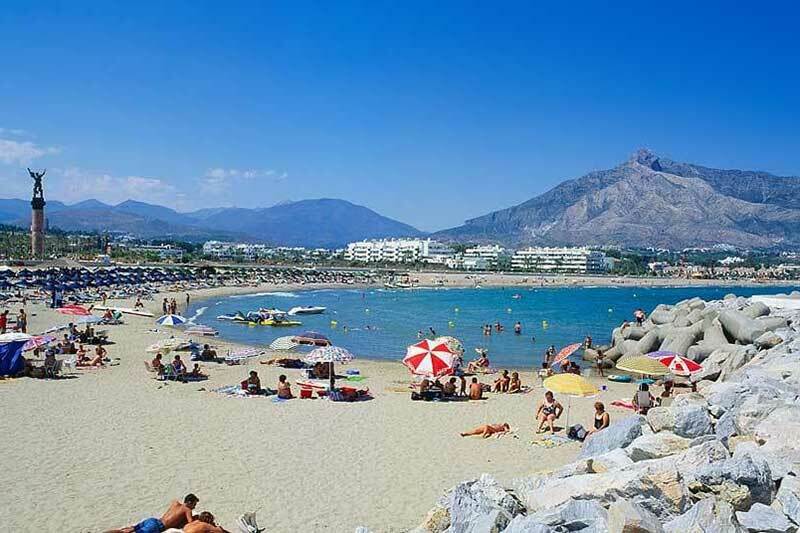 Marbella can be reached via the coastal road, the N340 which from Malaga airport will take approximately 50 minutes or so depending on traffic. The other alternative is via the AP7 toll motorway which will reduce travelling time by some 20 minutes approximately, the motorway joins the regular road just before La Canada shopping centre on the outskirts of Marbella. Another alternative is to do the trip by bus which takes a little over an hour and can take you straight into the city centre. The main street in Marbella is Ricardo Soriano which is the main drag through the city, a wide avenue with modern shops, bars, coffee shops and palm tree lined streets running of it. 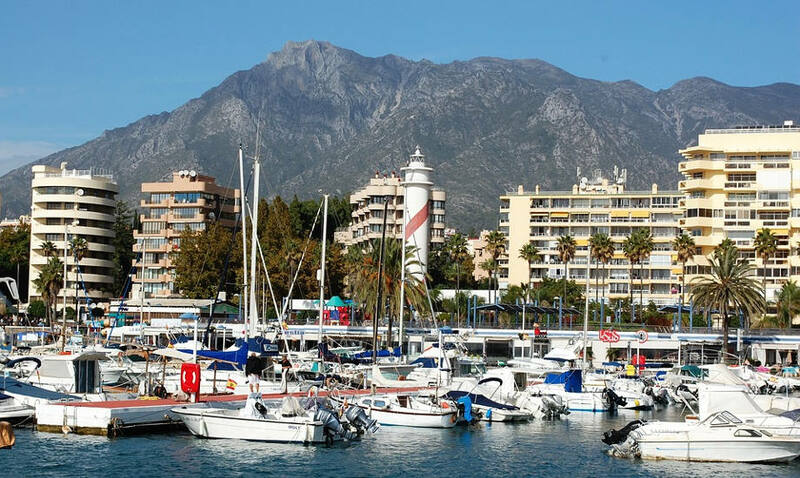 Marbella was once a small fishing town made popular during the 1950’s, according to statistics, its population increased by 897% between 1950 and 2001. Marbella’s climate is a great attraction to foreigners and nationals alike wishing to holiday on the Costa del Sol, as well as for those in search of property, its ideal Mediterranean climate with an average of 2900 hours of sunshine per year and an average temperature of 18 degrees have made it a top destination. Away from all the tourist targeted shops and upmarket restaurants lies a far quieter side to Marbella, still very typically and traditionally Spanish with narrow streets lined with orange trees, almost as if all the modernisation that has happened all around it bypassed this area. There are numerous golf courses in Marbella which is yet another great attraction to the area, some golf courses around Marbella areAloha Golf (Nueva Andalucía), Cabopino Golf Club (Urb Artola Alata), Guadalmina Golf Club (Guadalmina Alta), La Quinta Golf (Nueva Andalucía), Las Brisas Golf Club and Los Naranjos, these are just some of the golf courses within the immediate vicinity of Marbella. There are golf courses to suit most individuals’ skills with a wide variety of difficulties depending on the course. The new port to be built in Marbella is said to rival the most luxurious ports in the world, it will have a 200m quay for cruise ships, 1200 + moorings, new 5 star hotel, new restaurants, shops and bars. Marbella has plenty to offer for all people all year round, whether you are looking for an action-packed fun time or for a quiet and relaxing time.